A 100-year-old woman is strangled by her roommate, but a lawsuit against the nursing home gets blocked from court. Another nursing home dodges a suit when a 94-year-old patient suffers an unexplained and fatal head wound. An Arizona facility manages to duck a negligence suit when an elderly Alzheimer’s patient endures two sexual assaults in two days in a nursing home. How can these and other similar efforts to seek justice for the aggrieved fail to find their day in court? Federal regulators, with oversight on 1.5 million nursing home residents and more than $1 trillion in Medicare and Medicare funding, finally have stepped in with new rules in answer. Nursing homes will now be barred from forcing arbitration onto their customers. That means that nursing homes will no longer be able to push significant problems involving negligence, elder abuse, sexual harassment, and even wrongful death, out of public view and the civil courts, and into the private system of arbitration. This is a big win for consumers. As the New York Times has reported so well, nursing home patients find themselves needing care typically when they are most fragile. They’re ailing, weak, confused, and distraught over their loss of independence. Their loved ones are in duress, too, scrambling to secure hard-to-find quality care for these debilitated elderly. The Times, in a terrific recent series, detailed how arbitration all too often is a private system stacked against claimants, notably consumers, workers, and patients. The arbitrators aren’t judges, independent but checked still by voters and peers and conducting their business in public. Instead, they often are onetime corporate lawyers, many employed by for-profit companies that make it clear to them that corporations that steer many cases to them provide their bread and butter. Cases aren’t resolved in public and results don’t need to be published or shared, so the paper says, arbitration can end up with terrible, arbitrary results. Nursing homes have fought tooth and nail for arbitration because they say it protects them against frivolous suits, and provides a speedier, more efficient, lower cost, and fair way to resolve claims and disputes with patient-consumers. But 16 states and the District of Columbia strongly disagreed. They and other consumer groups said arbitration was hiding too many instances of bad care in nursing homes, and that too many patient-consumers were getting treated unfairly in the private dispute system. They pushed the Centers for Medicare and Medicaid Services, an agency under the Department of Health and Human Services, to issue the new rule barring nursing home arbitration clauses. As someone who has spent a career in the civil justice system, I share the growing concern with the rise of arbitration. Theoretically appealing on paper, arbitration has burgeoned under the direction of avaricious corporate interests, and, as a pro-consumer justice group notes, it now puts a core, constitutional right for us all at stake. 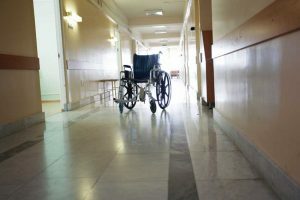 Lawsuits against nursing homes and medical caregivers can be complex and challenging for plaintiffs. But our open and public civil system gives them the crucial assistance of legal advocates and better guarantees of fair outcomes. Research has shown, for example, that in 30 percent of 1,449 closed cases studied over eight years, no money was awarded in claims where arbitration clauses were in effect; that compares with 19 percent of those cases in which no money was paid and no such clauses were in effect or were ruled invalid. To those who can’t see how badly arbitration has untracked fairness and justice, the scandals at Wells Fargo offer a pungent reminder. Our vulnerable elderly deserve better protections, and I’m glad to see steps occurring to encourage this.